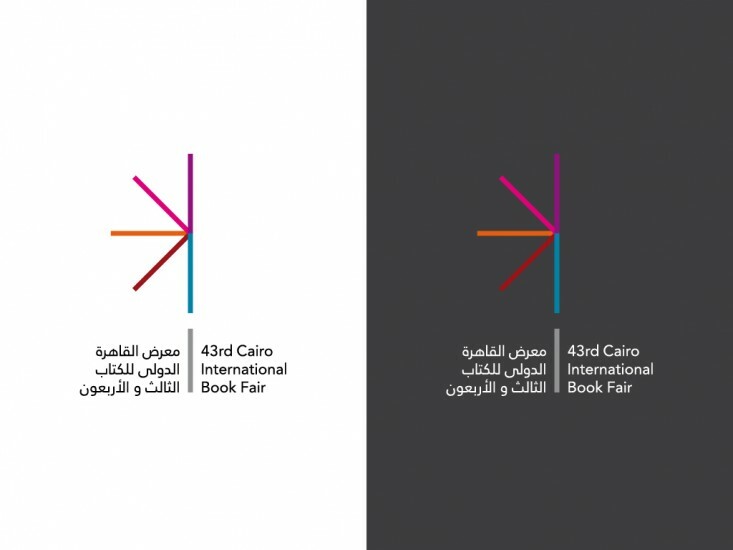 The Cairo International Book Fair is the largest and oldest in the Arab world. 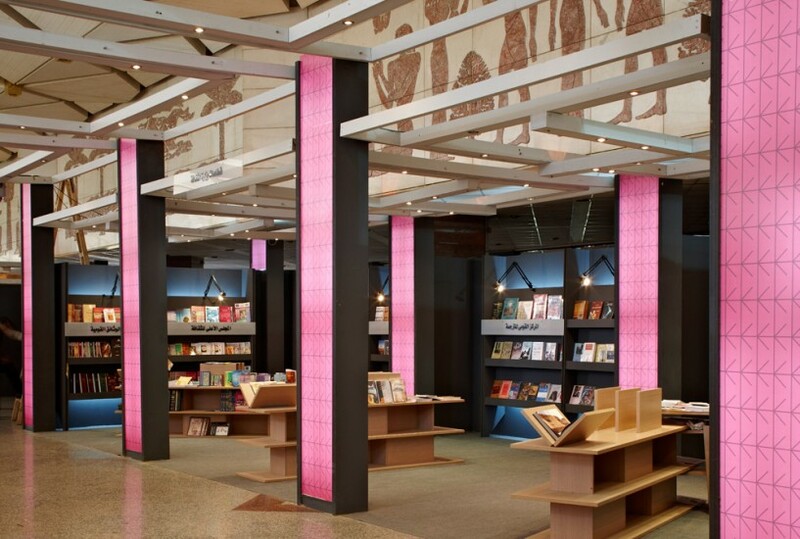 After the Frankfurt Book Fair, it is one of the most important book fairs in the world, attracting around 2.5 million visitors each year. 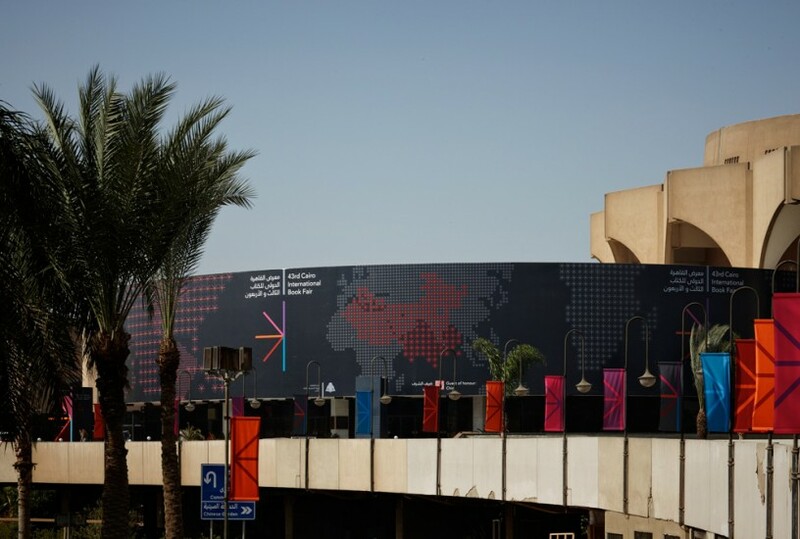 It is open to both trade and the public. 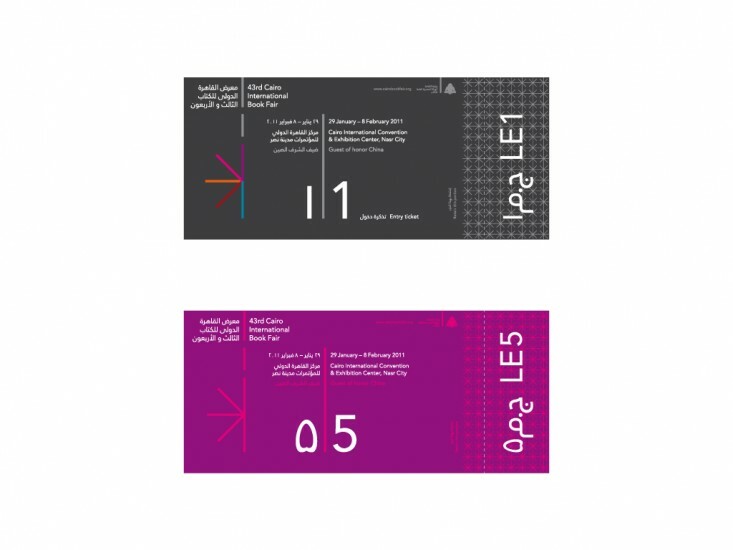 Jog was commissioned to undertake a comprehensive rebrand and redesign of the fair with the brief of transforming and greatly enhancing the visitor experience. The scale of the project and the site was vast. 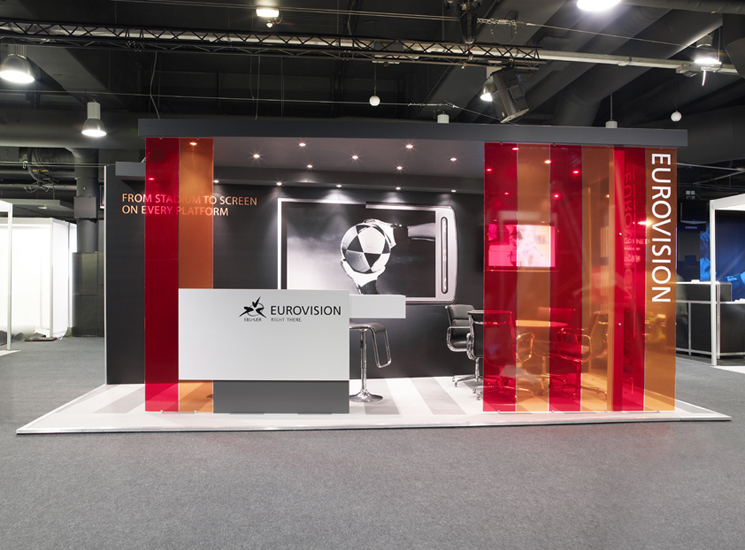 Among other things Jog created more than 1640m2 of exhibition stands and 4000m2 of building and tent wraps. 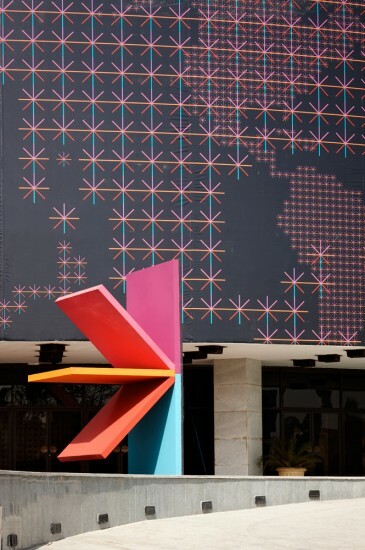 Additionally, Jog created entrance sculptures, wayfinding, lighting, conference staging, VIP and VVIP areas as well as ticketing and advertising. The project was completed from blank sheet to fully-built handover in just 2.5 months. A strong and simple symbol was created showing a book from its most distinctive perspective – an idea inspired by Egyptian hieroglyphics. 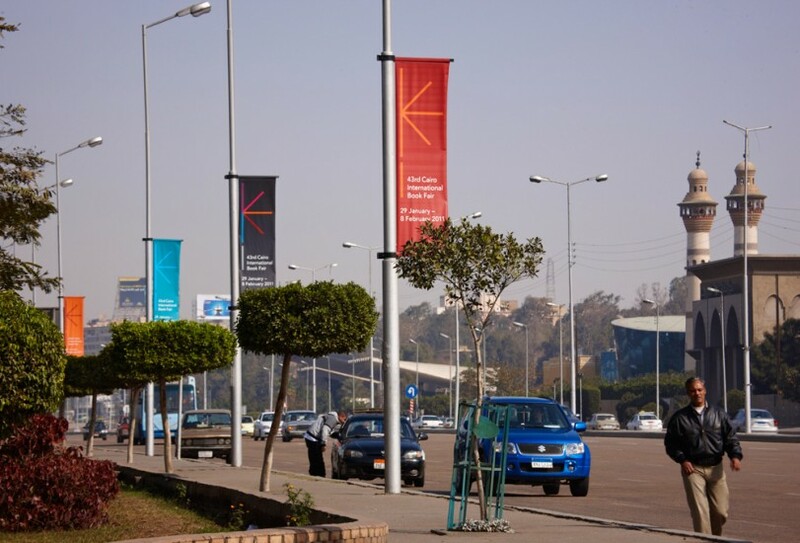 Jog also project-managed the manufacture and installation of all elements on-site in Cairo, posting a specialist project manager in the city to ensure completion to time and spec. Key to Jog’s approach to designing the identity was an understanding that careful selection and use of the brand’s typeface was crucial. Jog selected a font where both Roman and Arabic characters had been designed by the same individual, this created a singular tone of voice across both languages used in the branding. 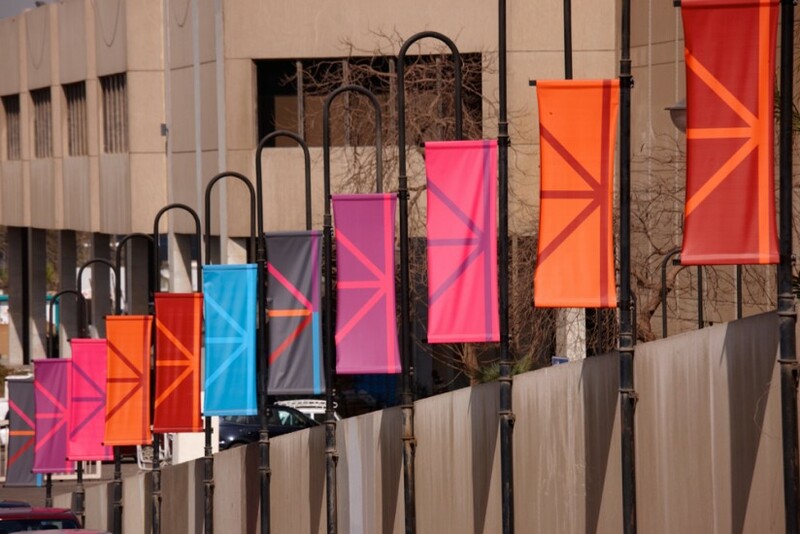 It also created a pleasing visual consistency and clarity. 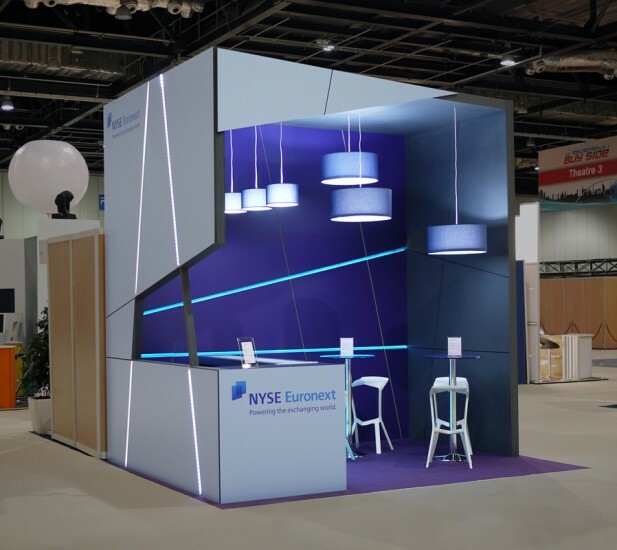 The New York Stock Exchange (NYSE) asked Jog to create a stand for the TradeTech exhibition in London. It wanted to break the mould of hard-selling stands. 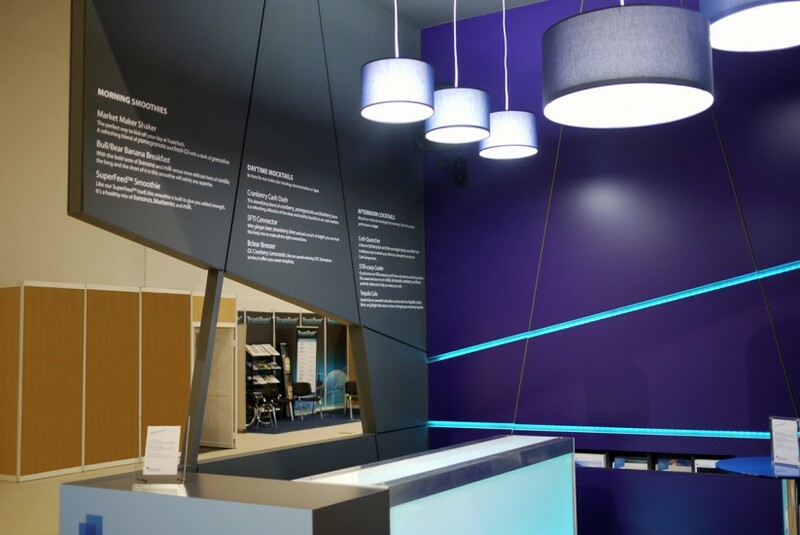 Jog created a space that would enable it to focus on clients’ needs rather than using its own agenda as a starting point. 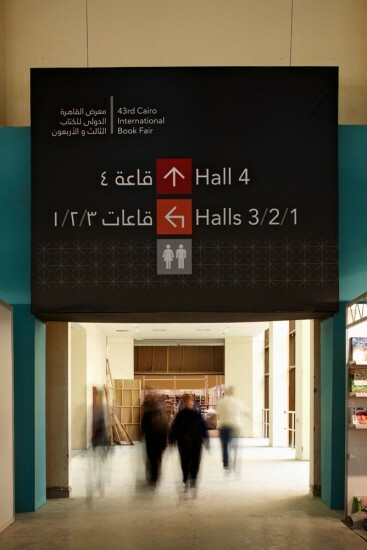 Jog conceived the entire stand as a bar in which delegates could relax and escape the frenetic exhibition environment. Molecular mixologist bartenders created unique cocktails, with each drink named to reflect a product or service that NYSE was offering. The molecular mixologist bar tenders performed regular displays of their craft and the bar was oriented to one careener of the stand both the attract attention of passing delegates and to make best use of space beyond the confines of the stand itself. Jog’s stand enabled NYSE to start its conversations in a much more natural way while providing opportunities to steer the conversation to its various product offerings as appropriate. 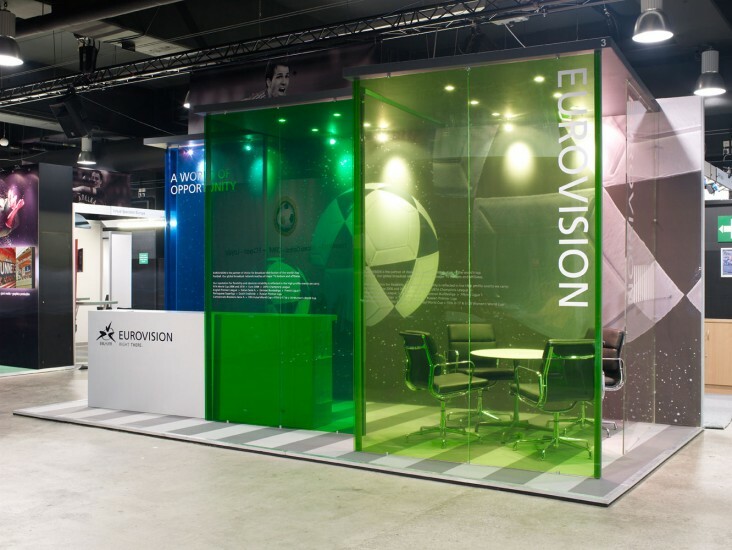 In its branding work for Eurovision, Jog focused heavily on strengthening its position as the most reliable, authoritative and credible broadcast network in the world. 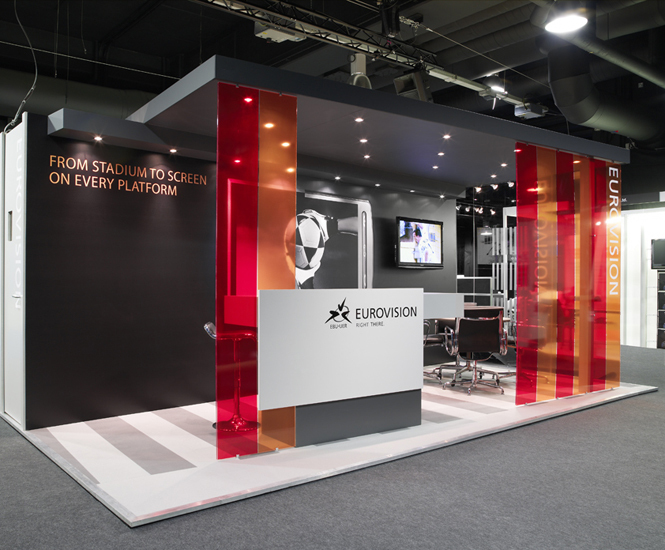 As part of this, Jog designed and built a series of exhibition stands aimed at raising the profile of the brand while acting as a place for serious discussion. A key objective was to refresh the approach for each event but to do this in a way that strengthened rather than diluted the brand. 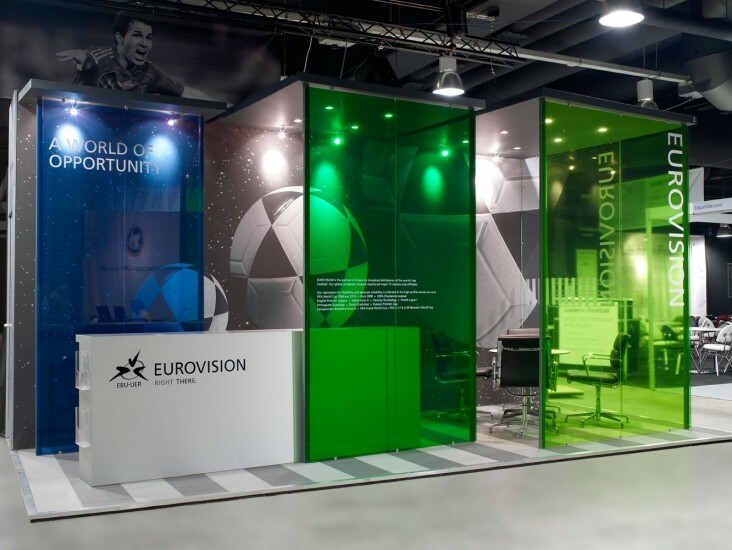 By restricting the colour on the stand to acrylic panels Jog differentiated Eurovision from the competition, which almost exclusively relied on large colour images. 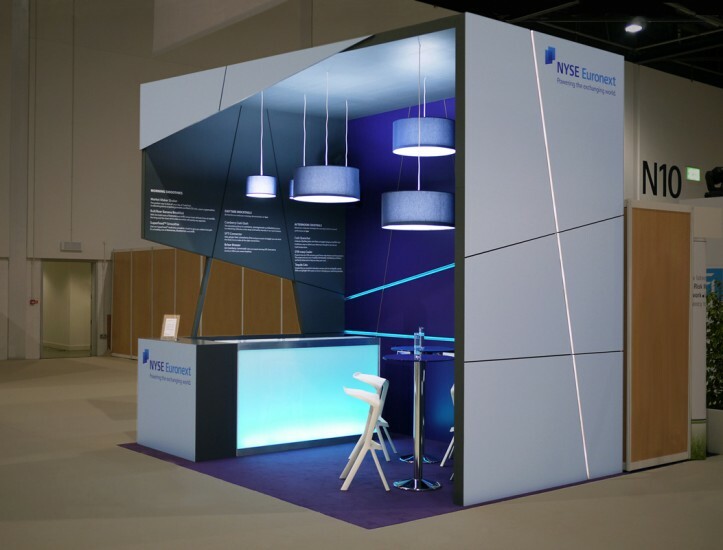 By creating a single long counter for short laptop-based presentations, Jog was able to give a generous area to the seated negotiation booth. 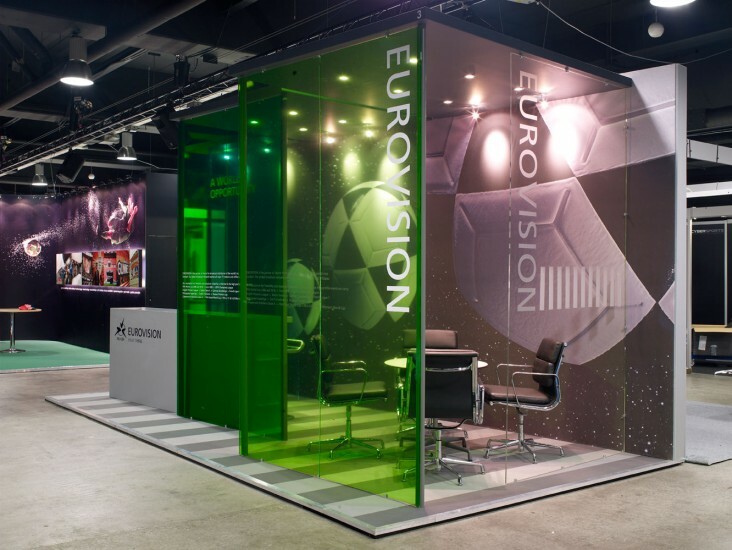 The prominence of this area, and the high quality furniture chosen, mades it clear that Eurovision meant business at the events and was not there for profile alone. 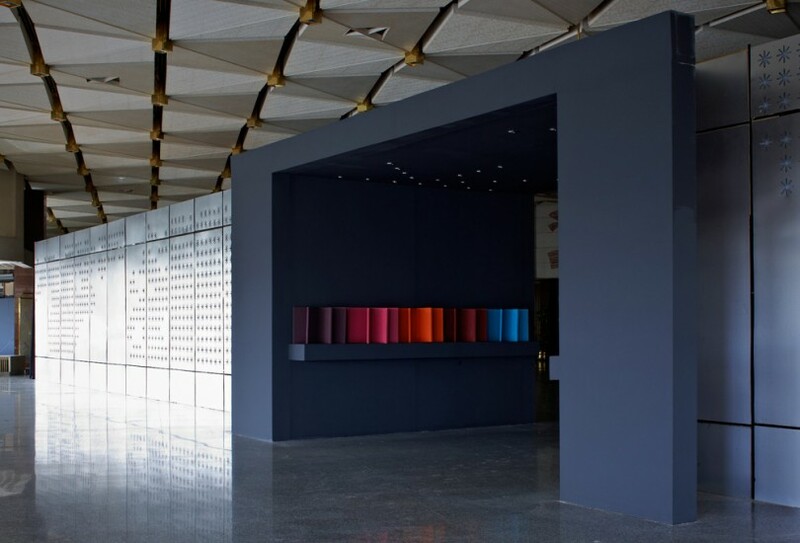 Jog adapted this approach for a series of exhibition stands across four continents.